In June 2015, archaeologist Don Blakeslee led a wide-ranging field study in central and southern Kansas. One of his primary goals was to re-discover the long-lost city of Etzanoa. The location, size and significance of Etzanoa, “the Great Settlement,” as Spanish explorers labeled it after their 1601 expedition there, had become lost in the mists of time. For many decades archaeologists debated these issues. But in recent years, Wichita State University anthropology and archaeology professor Dr. Blakeslee became convinced that the town inhabited by 20,000 ancestral Wichita Indians — the second-largest, or perhaps the largest, settlement in North America in the early 1600s — was hidden in plain site. It was in Arkansas City, Kansas. Eastern areas of the town had been the subject of several previous archaeological studies over the decades since the 1930s. But together they concluded that there were multiple archaeological sites in the area, not one continuous site representing a massive settlement. One of the main factors that led Dr. Blakeslee to that conviction was a new, more precise translation of old Spanish documents, accompanied by maps. The documents were created from an official interrogation of the 1601 expedition members. The latest translation was published in 2013 by language scholars at the University of California at Berkeley. After a study of the newly translated documents, Dr. Blakeslee decided to check the expedition members’ descriptions of Etzanoa and their encounter with the Wichita against the archaeological record. Then he organized and led the large-scale archaeological field study in 2015. Artifacts discovered during the 2015 study and follow-up digs in 2016 and 2017 have added to overwhelming evidence dug up in previous decades to show that the massive town was located in what is now Arkansas City. During the digs in recent years in eastern Ark City along the lower Walnut River near its confluence with the Arkansas River, archaeologists and volunteers unearthed multiple stone tools, weapons and cooking utensils used by the ancient Wichita. They also found Spanish artifacts, including a horseshoe nail, bullets and cannon shot fired during a fierce battle against an enemy tribe of Indians attempting to invade Etzanoa. The story of the Spanish expedition to Etzanoa in 1601 was documented the following year, in 1602, by Spanish authorities in Mexico City. They conducted an interrogation of expedition members and a Wichita native who had been taken captive. The authorities asked for details of the journey, including geographical descriptions, the physical appearance of the Native Americans they encountered, and descriptions of the layout of Etzanoa — the size and shape of natives’ dwellings and agricultural fields. Expedition members took exacting measurements and from their count of the large, beehive-shaped grass dwellings, supported by wooden poles, they estimated the population at 20,000. They estimated that the town was at least five miles long. They noted that the town was on both sides of the Walnut River. It was laid out in clusters of houses separated by 30 to 40 paces. The clusters formed separated districts and between each district were cleared open spaces of 200 to 300 paces planted with crops of corn, beans, squash and pumpkins. The soldiers counted approximately 2000 houses in the two leagues (5 miles) that the Spaniards explored where the carts could go on the east side of the river. The circumference of each of the round, grass-and-wood houses was approximately 70 to 80 feet. Each house was inhabited by an estimated 10 people. Thus, the total population was estimated at 20,000. Two maps accompany the 1602 Spanish documents, both showing the location of Etzanoa. 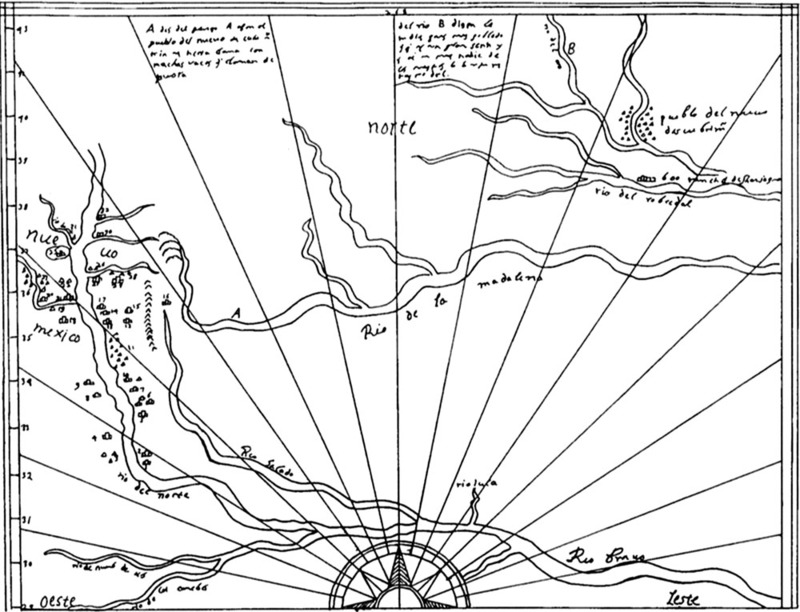 They include one drawn by Spanish cartographer Enrico Martinez from information provided by Juan Rodriguez, a member of the Oñate expedition. It shows the route of the explorers’ journey from New Mexico to Kansas. The other map was drawn by Miguel, the Wichita native taken captive. Both maps were difficult to understand because of the unusual way they were drawn, compared to today’s standards, and because of errors in previous translations of the 1602 Spanish documents. Using the latest translations and comparing eyewitness descriptions of geographical landmarks found by the explorers on their journey to the town and the archaeological record, Dr. Blakeslee was able to decipher the maps and pinpoint Arkansas City as the location of the Great Settlement. 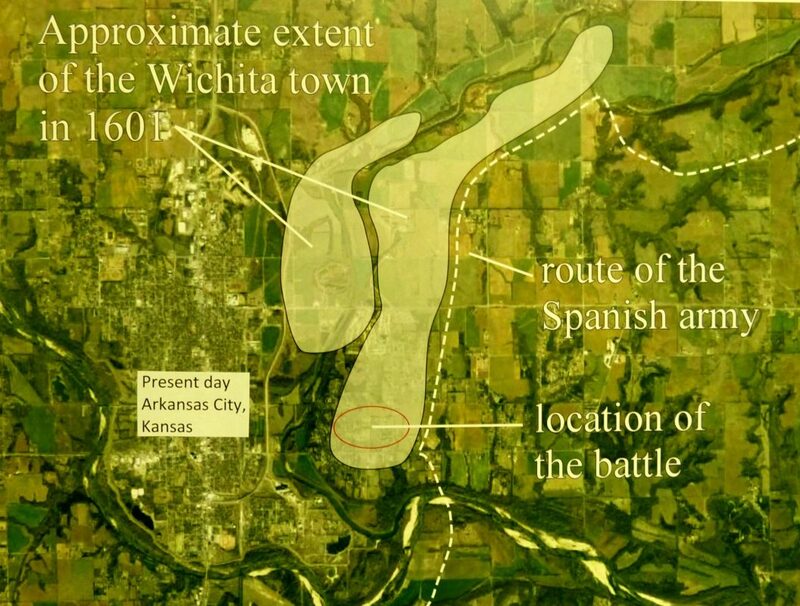 Etzanoa, the Wichita ancestors’ name for the Great Settlement, appears on the Miguel map.